A road neither straight nor crooked, neither level nor hilly, bordered by hedges, trees, and other vegetation, which had entered the blackened-green stage of colour that the doomed leaves pass through on their way to dingy, and yellow, and red. The grassy margin of the bank, and the nearest hedgerow boughs, were powdered by the dust that had been stirred over them by hasty vehicles, the same dust as it lay on the road deadening their footfalls like a carpet; and this, with the aforesaid total absence of conversation, allowed every extraneous sound to be heard. For a long time there was none, beyond the voice of a weak bird singing a trite old evening song that might doubtless have been heard on the hill at the same hour, and with the self-same trills, quavers, and breves, at any sunset of that season for centuries untold. There are lanes such as these wherever there are fields to border them. Lanes banked high with thorns and stingers, with elders and hops and cow parsley. Broken here and there for a stile and a path that wends through the ruts of a corn field. Blistering here and there with blackberries that stain the fingers after picking, or with sloes if you are lucky and have the patience for gin. Bees hum here. Eggs hatch. If the road itself is a flat press of tarmac, the tangled hedgerow is its counterpoint and lifeline. There are two kinds of road in the world. There is the built, blunt imposition, the highway that streaks traffic through the landscape (landscape be damned), bordered by lay-bys and hard shoulders and the roar of its own noise. Then there is the lane that feels like little more than the shadow of the hedge it passes alongside, a tiptoe path used as much by the badger and the hare as the automobile. A road such as this, threading softly-softly in the strange light cast through its overgrown banks, passes only with the blessing of the earth beneath. Roots have their say. Floods and dykes crack the surface. Roaring highways are never this subservient. Highways are a statement that humanity is here and now and thinks it has mastered its environment. There is a kind of poetry to both these roads. The words for country lanes and Mole’s garden plots are quaint and picturesque and, depending on your levels of disquiet and cynicism, charming or parochial. Some see landscapes such as those of The Wind in the Willows as wholesome and cherished worlds, whose humble virtues have seen too many of them fall unsung to the bulldozer and the landfill. Others get a queasy feeling when they read passages like the one above. To them the hedgerows are part of the rural domain of much-maligned Middle England: a twee lick of paint on a wasp’s nest of distrust and intolerance. One mole’s idyllic, ‘lane of evening lingering,’ is another’s path to Sandford or Royston Vazey. In the UK, hedgerows, dry stone walls and the little lanes that run between them are all in part a legacy of the Inclosure Acts, which fenced previously common land into the possession of the elite. Arguably, the Inclosure Acts took away the freedoms of many ordinary people within their landscapes. Suddenly, land that had long been roamed was prohibited. If you wanted to travel to the village on the other side of the valley, you could no longer just walk down the hill and up the other side, you had to go the way the roads led you. The Inclosure Acts still resonate in the British landscape. They are arguably the stem of that queasy feeling some city-dwellers complain of when they set foot in the countryside. Everyone can picture a shotgun-toting farmer yelling, ‘Get orf my land!’ and, in truth, there is far more freedom to roam in the city than there is in the country. In urban places, every street and avenue is a broad, public right of way. In rural Britain, the roads are a handful of threads through private property. The remnant of the free-to-roam that was before. It is no surprise, then, that down through the years the country lanes have received far more than their fair share of human traffic. They have been managed, plodded down, hacked back, sprayed with chemicals, laughed in, loved in, slept in, died in. They are older than we are, and they show their age. In Holloway, a work as suited to the poetry shelves of your local bookshop as the travel writing and natural history sections where you are likely to come across it, Robert Macfarlane writes the following of the book’s titular sunken country roads. ‘They are landmarks that speak of habit rather than of suddenness. Like creases in the hand, or the wear on the stone sill of a doorstep or stair.’ Like creases in the hand. If motorways and highways are roads with the humanity botoxed out of them, country lanes are deep-set wrinkles that show us the laughter and the sorrows of a population. The holloways of Robert Macfarlane’s book are roads modernity left behind. Once full of bustle and bluster, their high banks and narrow breadth made them useless for today’s motorised transport. As such they have been abandoned, sealed over by thorns and thistles. They remain as monument roads, stretching (geographically) from nowhere to nowhere, stretching (emotively) out of preceding centuries, towards us, now, in our present. Such places attract poets. 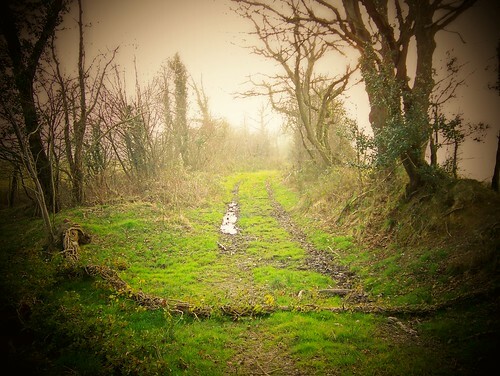 Edward Thomas writes about a lane beloved by one Bob Hayward, who planted it with elm trees. How different these kinds of roads are to others elsewhere in the world. The quintessential American road poem is Robert Frost’s The Road Not Taken, in which the narrator stands at the fork of two untrodden roads in a yellow wood and has to decide which path to follow. ‘Knowing how way leads on to way,’ he doubts he will ever find himself back there to walk whichever path he doesn’t follow, and so the poem becomes a pretty metaphor for life’s untaken choices. Frost, however, published this poem in 1916 in a continent that to this day still boasts vast and barely inhabited reaches. In America, paths can stretch towards a kind of infinity. That’s not so true in Britain, especially in England, where even our maps are overcrowded. Here we have roads such as Macfarlane’s holloways, which have been snipped off and discarded like old lengths of ribbon, and no longer even lead from one destination to another. What these roads do have are innumerable ghosts. There are more of them in William Barnes’ poems. You have to put on your best Wurzels accent to read this. 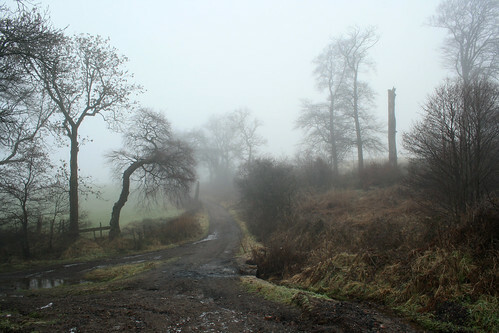 It’s about Bob Hayward, a widower, travelling up and down the hedged lane to his house on Woak Hill. As he travels, he can feel the ghost of his wife so strongly beside him that it’s as if the afterlife is there in the shaded lane with him, rather than in some unhedged heaven. An interesting thing has happened in the last fifty years. A bizarrely structured, sometimes interminable, sometimes beautiful, overlong epic of a novel, based on a made-up language, has been published and gained worldwide popularity. You have probably guessed which book I mean, for it seems impossible that anything quite like it could get published today. The film trilogy, and all of the toys, games, calendars and lunchboxes this has led to, has expanded its appeal across the globe. The story of this cultural juggernaut involves, simply put, four fretting little men in waistcoats doing their best to stop the rest of the world from killing each other and mucking up their bit of countryside. It would be hard to argue that Tolkien’s Shire is influenced by anything more than it is by rural England, but the interesting thing is that the hobbits’ quest resonates with audiences worldwide. People all over the globe are rooting for these little men because something about them and The Shire speaks to them as worth saving. Is that thing rural England itself? If it was, wouldn’t we see the people of all nations lobbying the UN to intervene every time someone threw up a new bypass in the greenbelt? The Lord of the Rings is often criticised for being, at its heart, a defence of an outdated parochial system: Little Englanders protecting their pipeweed. I don’t think the text really supports such a claim. The novel itself is surprisingly scornful of small-mindedness hobbits. Likewise it is not the lanes of Middle England, whatever that may mean to folk in town or country, that are worth fighting trolls and cement mixers to save. It is the ghosts that tread them. And they tread them not only in the country tracks of Britain, but wherever in the world ordinary people have lived and loved and passed by and died and done it all again throughout consecutive generations. The roads that run under hedgerows are haunted by an accumulation of all who have trod them before, and such a spectral throng will speak to the perceptive traveller at dawn or in the gloaming light. Perhaps we should treat these places with the same reverence we would our graveyards.